Posted on October 16, 2018 at 7:53 pm. 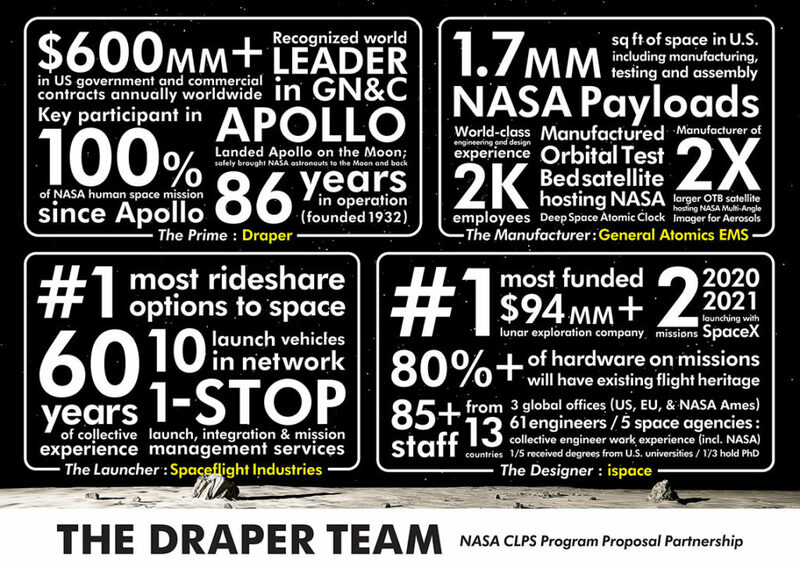 Draper, a company with a heritage in space exploration dating to the Apollo moon landings, announced today its team for the National Aeronautics and Space Administration’s (NASA) Commercial Lunar Payload Services (CLPS) contract. Under the proposal the team will support NASA in the delivery of small rovers and instruments to meet lunar science and exploration needs, advance development of lunar landers for human missions and conduct more research on the moon’s surface ahead of a human return. Draper, as prime contractor, will lead a team that brings extensive and highly relevant experience in space, with partners that include General Atomics Electromagnetic Systems, ispace and Spaceflight Industries. NASA announced its CLPS program in December 2017 and invited commercial partners to form teams to bid on the project. At the time the space agency said it is returning to the moon and to destinations farther into the solar system with commercial and international partners as part of an overall agency Exploration Campaign in support of Space Policy Directive 1. In accordance with the terms of the proposal, Draper will provide payload operations and the guidance, navigation and control systems for the lunar lander, as well as overall management and coordination of the team; General Atomics Electromagnetic Systems is responsible for carrying out the lunar lander manufacturing, assembly, integration and testing in the United States; ispace will act as the design agent for the lunar lander and mission operations, as well as provide high-frequency rideshare opportunities; and Spaceflight Industries Inc. is responsible for launch services including integration, mission management, launch and range documentation and pre- and post-operations. In support of the national interest, NASA has mandated that the prime contractor provide a CLPS that uses domestic end products for all space transportation vehicles required for performance of the contract. Draper and the team prepared the proposal with that goal in mind and to satisfy the requirements of NASA’s Domestic Source Certification.